Hello, my name is Hayley. 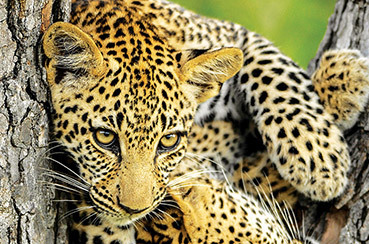 I have been working at Leopard Mountain for 5 months now and I am head of housekeeping and a lodge anchor. Yesterday started out as a normal day, I came in to work that afternoon and continued with my daily duties preparing everything for dinner and the guests’ return from game drive. The afternoon game drive had just left the lodge. Brendan, one of our volunteers, and myself decided to head to the lounge for a glass of water because it had been so hot that day! We went outside onto the deck to take in the beautiful view and noticed a Wahlberg’s Eagle hovering in the sky making such a noise. As we watched the eagle through our binoculars we heard alarm barking from some Kudu and Nyala which had been feeding on the hillside. A few kudu came running out of the bushes and we looked at one another in unison thinking, “there has to be something there!” We looked hard for what felt like ages but must have only been a minute, and then we saw it – a female Leopard!!! She walked gracefully down to some rocks just below chalets 6-9. We were so excited! It was Brendan’s first Leopard sighting since he had started volunteering for Leopard Mountain and I couldn’t’t stop shaking I was so ecstatic. I had to control myself and calm down before calling in the sighting on the radio. We watched it for a long 10 minutes just casually walking along, It stood next to an old dead tree and sat on some rocks and stared right at us! What a reagle creature, perfection, beauty, strength, my favourite animal! 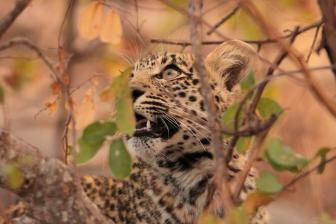 Brendan was looking through the binoculars and saw something emerge from the bushes – another Leopard! We couldn’t believe it! We were dancing around on the deck like 2 school children watching in amazement as the second Leopard walked up to the first and greeted her fondly; a mother and her cub. They played and explored their area and then as quickly as they had arrived they disappeared back into the thicket with no sign of ever being there. Wow, what an amazing experience!